WELCOME TO THE JUNE EDITION OF THE GO TEXAN ROUND-UP INFOLETTER. hile it’s not officially summer until June 21, here in Texas, it has felt like summer for quite a while already. other parts of Texas. It’s another great woman-owned business success story that shows that you can’t beat the strength, wisdom and entrepreneurial spirit of our Texas ladies. Go ladies, GO TEXAN! Please take a look at all the other information on events and opportunities inside this issue that will help you promote and expand your business. If there are any other ways we can serve you through our GO TEXAN program, please don’t hesitate to contact our great staff. We’re all in this together, and we want nothing more than to promote the products, culture and communities that call Texas home. I hope you enjoy this issue of the GO TEXAN Round-Up infoletter. Remember friends, Texas agriculture matters! It was in that moment that the great salsa theft turned into the creation of a new Texas business. Sandy and her son, Kris, knew they had a daunting task ahead of them, yet they had a vision that kept getting them up in the morning. That vision was to change the world’s view of salsa. In their household, salsa was never just a frivolous side. The salsa is what made their dishes taste great. It wasn’t long before loyal customers were coming back and sharing recipes of dishes they made with Sabrosos Salsas. This idea of handcrafting in small batches is what sets Sabrosos Salsas (Spanish for “tasty” or “delicious” salsa) apart. Instead of producing salsa on a mass production scale, they aim to keep the personal touch. Sandy and Kris Maloney with Jody Hall, H-E-B Director of Sourcing, at the Quest for Texas Best Finale. 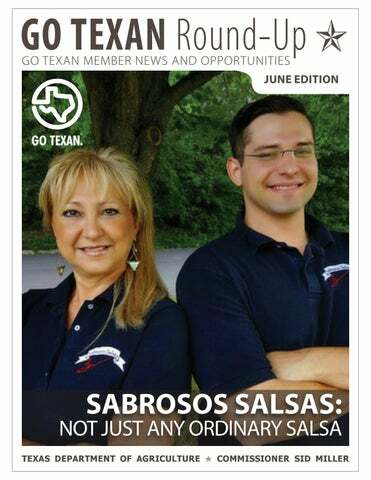 Sabrosos Salsas is a very proud GO TEXAN member. They enjoy the many big opportunities like sampling at the State Fair of Texas that are made available to GO TEXAN members. moruga scorpions and others. They have planted a big garden in their side and back yard at home, which is assigned for their peppers, as well as their newest venture — growing their own tomatillos. 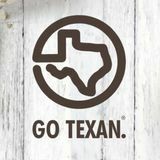 Mark Your Calendar Events & Opportunities for GO TEXAN members What: TRA Marketplace When: July 9-10 Where: Dallas Details: The Southwestâ&#x20AC;&#x2122;s largest gathering place for restaurant industry movers, shakers and bakers. GO TEXAN members get an exclusive discounted 8x10 booth space for only $1,500 (normally $2,240). Ask about the GO TEXAN Pavilion. If you would just like to attend, register with this code for free admission: GoTx7. Admission price is $65 onsite. For more information, contact Chris Cobb at (512) 457-4194.
agricultural markets for U.S. exporters. Suitable products include, but are not limited to: seafood, pet food, grocery and convenience, confectionary and processed fruit, dairy and dairy products. Registration deadline is June 16. For more information, contact Carlos Guerrero at (512) 463-6507.
changing their tastes and consumption habits for new products, making the Brazilian food market an interesting option for U.S. exporters. The Brazilian market for consumer-oriented food products is very promising and fortunately it has been less affected than other sectors of the Brazilian economy. This trade mission offers SUSTA companies the opportunity to meet one-on-one with key buyers from Brazil in either Chicago (11/11) or Atlanta (11/13). Suitable products include gourmet products, condiments and sauces, grains and cereals, olive oils, snack foods, health food products, fruit and vegetable juices, frozen meals, confectionary products and pet foods. The deadline to register is September 15. For more information, contact Carlos Guerrero at (512) 463-6507. What: PLMA Show When: Nov. 12-14 Where: Chicago, Illinois Details: This event organized by the Private Label Manufacturers Association (PLMA) has linked retailers and suppliers for over 30 years. This market segment has great sales potential for SUSTA region companies. Best prospects include but are not limited to: gluten-free, GMO-free, beverages, ethnic foods, snack foods, nuts, condiments, seasonings and sauces, organic products, specialty meats and dairy products. The deadline to register is August 18. For more information, contact Carlos Guerrero at (512) 463-6507. Managed by the Texas Department of Agriculture, the STAR Fund was created to collect private donations from individuals and businesses to help Texas farmers and ranchers affected by natural disasters. It is a helping hand, not a handout. If you or your company would like to make a tax-deductible donation to the STAR Fund, please contact TDA today. The need is always great. Cabernet Grill was highlighted in Senior Resource Guide. Congrats to Fischer & Wieser just won two SOFI Awards from the Specialty Food Association for their Cherry Balsamic Preserves and Dr. Fooâ&#x20AC;&#x2122;s Bali BBQ Sauce. The GO TEXAN Texas Gulf shrimp program was mentioned in The Port Arthur News. Frontier Meats was featured on MyHighPlains.com. Your free classified ad section to advertise your service/product to other members. In search of a service or product that a GO TEXAN member already provides? Find it by networking here. If you have something to list here, email the info (50 words or less) to us, and we’ll include it here in the next infoletter. Post #2 Quality Brand Promotions: Save money by sharing the cost of a retail sampling session by partnering with other GO TEXAN food and beverage members for joint samplings. Do you make a food or beverage? Would you like your product sampled with twice the customer appeal and at a reduced cost to you? Contact Post #1 Quality Brand Promotions and U.S. Dept. of Agriculture (USDA): we’ll help connect you with other America’s farmers and ranchers interested members, to set up will soon have the opportunity to the sampling events. They cover strongly represent agriculture in every single city in Texas, with their communities and industry well-screened ambassadors, to do by taking part in the 2017 Census the sampling for you and spread of Agriculture. Conducted every awareness of your brand. For more five years by the U.S. Department information, Contact Thomas A. of Agriculture’s (USDA) National Simon at (512) 491-7911. Agricultural Statistics Service (NASS), the census, to be mailed at Post #3 the end of this year, is a complete U.S. Dept. of Agriculture (USDA) count of all U.S. farms, ranches, Attention all GO TEXAN producers: and those who operate them. So, USDA is seeking comments on a when you get the census in the proposal for a new industry-funded mail, please fill it out and send it in! research and promotion program. Your fellow farmers depend on it. Click here to learn more. Exclusive publication for GO TEXAN members,, with the Latest news, events and opportunities.